This week we were thrilled to preview Downton Abbey: The Exhibition at CityPlace in downtown West Palm Beach. The team behind the beloved show and soon to open exhibition joined us as we explored the halls of Downton and sat through a Q&A session. Gareth Neame, Executive Producer at Carnival Films, is currently filming the Downton Abbey movie just outside of London. It is slated for release in late 2019. He gave insights as we made our way through the vignettes, noting how he felt like he had somehow been transplanted back on set overnight. The exhibition features some of the most memorable nooks of the series including the kitchen, Carson’s pantry and Mary’s bedroom, ending with a striking turn into the grand dining room. The series ended three years ago, yet just hearing the opening melody playing from above transports you back into the time of the Crawleys. And the familiar faces, like that of Carson, greeting you at entry feels like you’ve returned to visit friends. The team laughs recounting a very special visit to the set by Kate Middleton, Duchess of Cambridge. While the cast prepared eagerly for her arrival, they were shocked to see her starstruck by Brendan Coyle (aka Mr. Bates) who was equally starstruck. One eye-catching feature is an immersive room with seating surrounded by digital walls that take you in the the Great War and daily happenings of the family. Those who have not seen the show can still enjoy the displays, which include information about the time period and current events during the show’s era. The displays of fashion and costumes featured in the series are a mix of produced and vintage, detailed and in many cases enviable. The costumes were carefully curated with the help of Anna Robbins who also oversaw the dressing of the show. The teams both on and off the screen have worked painstakingly to ensure the authenticity, historical accuracy and do justice to the rich subject matter of the series. The team joyfully reminisces over how children have shown up to red carpet events with signs reading “I passed history because of you.” The sets shown in the exhibit were produced under the guidance of the original team and create a unique impression when seen altogether at once as opposed to over the course of hours of television and storylines. The exhibit will most likely see a refresh after the release of the movie. Dominic Burns, Senior Vice President of Brand Management for NBA Universal International was also on hand to discuss the exhibit alongside Gareth. 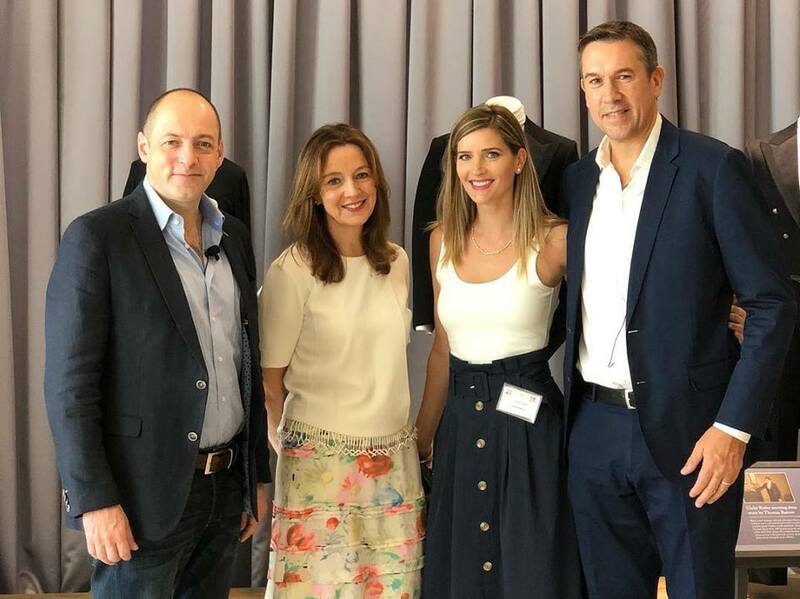 New York City debuted the exhibition, however the venue in Palm Beach has allowed the space and configuration to best suit the original design and vision. This iteration also features a handful of items that were unable to fit into the NYC version. In fact, there are items that weren’t even necessarily seen on the show that have made their way including handwritten letters by the cast during scenes. Enthusiasts will be pleased to see memorable props like the telegram announcing the sinking of the Titanic, the toy dog Lady Mary gives Matthew at the train station and the first curling tongs used to style her. The team refers to swimmers, who make their way through the exhibition in under an hour, and divers who can spend over two hours or more experiencing the details, opening drawers and listening to cast interview on the audio tour. Dominic believes the Crawleys would approve of the Palm Beach destination as it was the vacation destination of aristocratic families like the Rockefellers. Gareth has his own ties to Florida as his great grandmother, Ivy Close, was a silent movie star and beauty queen. She was named the “Most Beautiful Woman” in 1908 and graced the cover of the Daily Mirror. She came to Jacksonville, where films were shot at the time, and may sound familiar to viewers who may recall the scullery maid, Ivy Stuart, who shared the same name as a movie star. The contemporary background of Downton Abbey allows viewers to relate to the Crawleys and British aristocracy in a way other productions have been unable in the past. The limitations on authors to discuss certain things in the 19th century left many daily struggles, needs and occurrences unspoken. Downton Abbey has heralded a global fascination and paved the way for series like The Crown and others. The success of the series was overwhelming and surprising with a fanbase of over 200 million fans worldwide. The series has won 3 Golden Globes, 15 Primetime Emmys, and a Screen Actor’s Guild award among others. The exhibition serves as a legacy piece and allows fans and beyond to be immersed and engaged. 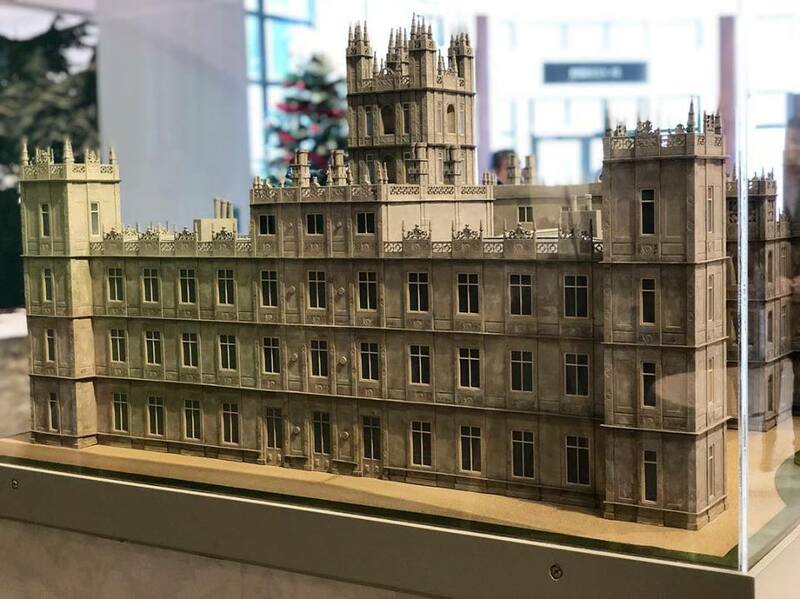 West Palm Beach is honored to host Downton Abbey: The Exhibition, as it will likely not return to the Southeast after its run. While locals are excited by its presence, it is actually a destination for many throughout the state and region. With the 100th Anniversary of the end of The Great War being celebrated in Great Britain this Sunday, it seems only fitting that this weekend should also mark the opening. Children ages 14 and under visit for free when accompanied by a paying adult.